​​Want to know how to remove scars? Scar removal is an often debated topic on the net and elsewhere. You will find that there is no final answer on the right way to get rid of scars. There are dozens of natural scar remedies, designer scar creams, surgical procedures, and an array of other scar treatment options. But which ones really work? 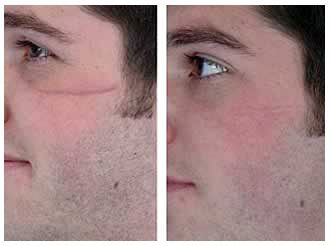 Scar creams and surgeries can be really expensive and don't always deliver the best results. Most home remedies are nothing more than rumors and old wives tales and don't really do anything to reduce scarring. If you really want to know how to get rid of scars for good, here are some simple tips that work for nearly any scar. First of all, before you start spending a bunch of money on expensive designer scar creams, you should research what you're actually buying. Most of these scar removal products are just a cocktail of moisturizers, Vitamin E, and maybe some "antioxidants" or other unproven fillers. When it comes down to it, these products are usually overpriced junk that don't do anything to actually get rid of scars. For instance, Vitamin E has not been proven effective for the treatment of scars. In fact it has shown to worsen scarring in some studies. Any positive effects you may see from these products are likely from the massaging of the area daily. During the healing stage, your scar is very sensitive to ultraviolet light. It can easily burn and become hyperpigmented and discolored. This makes the scar very red and ultimately much more noticeable. Once this damage has been done, it's a real pain to get rid of. Do yourself a favor and keep it covered. Exfoliating the top layers of the scar can help to flatten and smooth the affected area. Don't overdo this as you can irritate the skin and make your scar more noticeable. There are many natural acids that can do this gently. For instance, lemon juice is often touted as a natural bleach for scars. While this is somewhat true, its main function is to exfoliate the skin which helps flatten it out. This makes it a helpful natural product for getting rid of scars. There are many simple and natural products and techniques just like these that can dramatically reduce the visibility of many scars. Don't always fall for the common myths when it comes to natural scar treatment. Most of the well known natural treatments are ineffective. Never apply any topical product to the skin until you know it works, and more importantly, why it works. With the right combination of natural treatments and scar removal methods, you can reduce or eliminate scarring in many cases. No matter how old your scar is or how you got it, you can improve the appearance without expensive and costly procedures. For more information on natural scar removal, check out The Scar Solution. It's the most effective way to get rid of scars, guaranteed!